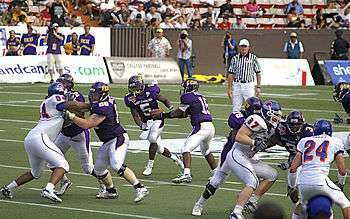 Running back Chris Johnson of the East Carolina Pirates (#5) receiving the handoff and rushing the ball during the 2007 Hawaii Bowl. Rushing has two different meanings in gridiron football. The first is an action taken by the offense that means to advance the ball by running with it, as opposed to passing, or kicking. The other is an action taken by the defense that means to charge towards the quarterback, kicker or punter across the line of scrimmage. When players on the defense are collectively rushing the passer (usually a quarterback), it is called the pass rush. In both offense and defense, any rushing player is called a rusher. Rushing, on offense, is running with the ball when starting from behind the line of scrimmage. While this usually means a running play, any offensive play that does not involve a forward pass is a rush - also called a run. It is usually done by the running back after a handoff from the quarterback, although quarterbacks and wide receivers can also rush. The quarterback will usually run when a passing play has broken down - such as when there is no receiver open to catch the ball - and there is room to run down the field. A team with a quarterback who is fast and skilled at running may regularly call intentional running plays for that quarterback, but this is rare due to the increased risk of injury. A wide receiver can act as a rusher on several kinds of plays, such as on a reverse, on an end-around, or on a lateral pass behind the line of scrimmage, which is a type of screen pass. However, a wide receiver screen play is usually intended to be a forward pass so that if the receiver drops the ball it is an incomplete pass instead of a fumble. ↑ Theismann, Joe (1 January 2001). "The Complete Idiot's Guide to Football". Penguin – via Google Books. ↑ "Outing". Outing Publishing Company. 1 January 1900 – via Google Books.